Thanks to Netgalley for an advanced copy! This did not affect my rating/review. Well, no one is more disappointed than I am. I thought that I would love or, at least, really enjoy this book. But I didn’t. 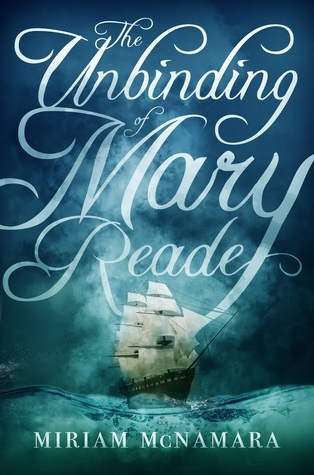 This book is a retelling of Mary Reade’s life. It’s well-known that she dressed as a male after her older half-brother died and her mother needed more income. This book takes that and then expands it to encompass a girl who is very masculine (in some ways, reminded me of my transman experience) discovering that the world isn’t accepting of her, along with discovering her sexuality. It’s told through flashbacks to 1717 and further back to show what happened in Mary’s life. What brought her to 1719 where she’s on a ship and meets Anne Bonny where, obviously, a romance develops. But… I didn’t like it. For a book about pirates, it was so dreadfully boring. It was dull to the extreme. I was tired of reading about pirates not doing anything. Literally, any time in the present (aka 1719) was filled with Mary and Anne’s relationship, with basically involved hashing out the same things over and over again. Which got boring. Then, the flashbacks were full of Mary pining after two people (one man, one woman) and trying to figure out who she is. While I really enjoyed the discovery part of it — because, it reminded me of that conflicted feeling of being trans; which is why I’d call Mary queer with both her gender and sexuality — it got dull after I realized it was going to be repeated over and over again with the same things coming up. It didn’t help that I didn’t think that Mary and Anne’s relationship was convincing. It sort of just happened after there was very little chemistry between them. The chemistry set in more after they were together. And, well, I didn’t think it worked. The writing was bland, the characters never stood out, and I didn’t like the slightly anachronistic feel I was getting from it. Sadly, it felt like the book was going to get a bit better where I DNFed it, but I couldn’t bring myself to keep reading and trying it. I could barely remember what I read each chapter because they were so alike. In other words, a book that wasn’t for me.